"Doner single handedly ruined Top Fuel on the West Coast." If you raced on the West Coast in the 70s, you knew the guy we all loved to hate - William Lee Doner - aka "The Dones". At one time he controlled 7 major drag strips in Washington, Oregon and California. SIR, Puyallup, Portland, Fremont, OCIR and Irwindale were all under the Doner umbrella and managed by a cast of charters worthy of a Monty Python film. To tell the Willie Lee story would make a book truly worth reading... and one would ask why one was never written - three words - statue of limitation. Doner the Movie would be an epic comedy that would struggle for an 'R' rating. In a nutshell, after getting fired from the Orange County Daily Pilot (sport writer) for getting busted in a vice raid, and after nearly driving Carroll Shelby out of business, The Dones headed to Seattle with a plan - sort of - and virtually no money. He and the infamous Father Duffy - along with the likes of Alan Green and Steve Evans - acquired (the DVD tells how) Seattle International Raceway. A legend was born and the end result was 4 closed drag strips, a laundry list of bankrupt associates and a contract hit by the collective Top Fuel racers (a joke). By the end of 1979, after Irwindale went belly up, all Team Doner had left was OCIR and it was on shaky ground. So, living up to his motto - "No problem is to big to run away from." - Doner and Big Red (his wife Kathy) decided it was time to get out of Dodge and move to Cabo San Lucas, Mexico. As a parting shot, some of his "friends" arranged to return to the scene of many of Doner's crimes (The Balboa Bay Club) in SoCal and hold a no-holds-barred roast aka good riddance party. 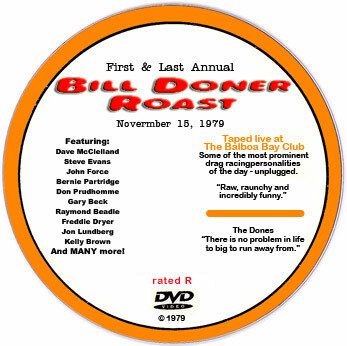 The results were 4 hours of drunken hilarity featuring a gaggle of roasters worth of an uncensored Comedy Central roast. The event was MC'd by Dave McClellan and video tapped in full by Richard Schroeder and Don Ewald. In 2006 Ewald tired (for the umteeth time) to get Schroeder to find the 3/4 master tapes which had been either misplaced or lost over the years. With the popularity of the DVD format both agreed it was time to unleash this masterpiece on the world. Long story short, Richard procrastinated until his untimely death. In one of their last conversations, Schroeder apologized for never finding the masters and asked Don to do the best with what they had and share this classic in time with the world. What they had was a VHS copy at EP and therein comes some truth in advertising. The DVD is no better quality than an EP VHS tape but its all there - all 2+ hours of it. Amid a flutter or two all the characters and audio is there. And trust me - it is Rated 'R'. 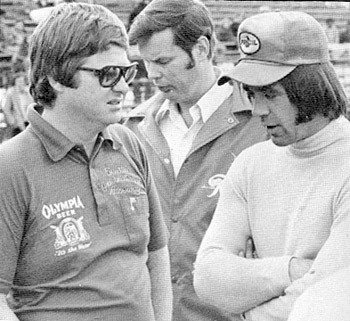 See John Force with black hair and in rare form - Steve Evans in his prime. Other players are: Gary Beck, Sid Waterman, Bernie Partridge (NHRA DD), Raymond Beadle, Jim Rockstead, Freddy Dryer (LA Rams), Tom McEwen, Don Prudhomme, Jon Lundberg, Kelly Brown, Larry Sutton, "Billy Bones", Bill Schrewsberry, "Waterbed Fred", Bill Tidwell, Carroll Shelby, Pat O'Day, "Father Duffy", Alan Green, Joe Pisano, Steve Wolmer, Mike Campbell, Alan Carr and more.